The only insect in the British Isles that swarms is the honey bee. If you think you have a swarm - it may be in your garden, house, garage, shed etc. please try to identify/confirm if you have honey bees. The honeybee should not be confused with a wasp or a bumblebee. Honey bees and wasps are similar in size but wasps have alternating black and bright yellow body stripes. Honey bees are brown, with paler brown or dirty yellow bands on the body. Bumblebees are furry. If you see hundreds of bees flying together they may be honey bees. And if they form a cluster they will indeed be honey bees because bumble bees and wasps do not cluster. A swarm of honey bees may cluster on a branch or structure. 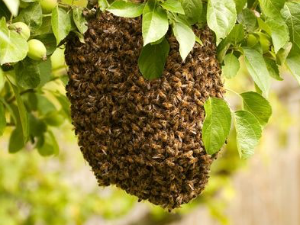 If you think you have honey bees, and if they are already lodged in a chimney, roof or wall space and have only appeared in the last few days, or if they are hanging from a branch of a tree or bush, then you have a newly arrived swarm. If the bees are causing a danger to you, children, pets or livestock, then call your Local Authority (Council) Pest Control Officer or an independent pest control company. There is likely to be a charge for this service. But if you have identified that the bees are honey bees, and they are not a danger, then you may prefer to offer them to a local beekeeper. The East of Scotland Beekeepers Association (ESBA) can assist. ESBA can provide a local beekeeper to visit and remove the swarm for you. The local beekeeper will firstly assess the site and, providing the swarm can be accessed without endangering the beekeeper, s/he will capture the swarm and take it away. ESBA covers an area within Tayside and Angus from the Perth area to Brechin and bounded by the coast North of the Tay and extending to North of Montrose. A beekeeper will be able to advise you and let you know when s/he can attend, and/or will be able to contact a beekeeper that can assist you as soon as possible.